Rotation is a property shared by most celestial bodies, including stars. Stars take birth in the core of molecular clouds from the infall of spinning matter driven by self-gravity. Rotation varies in time, it can be rapid or slow, but it persists all along stellar life. Ruled by the angular momentum conservation, rotation may lead to angular momentum, matter or/and energy transport between core and outer layers. We plotted (Fig. 1) the distribution of apparent rotational velocities (V sin i) as a function of the spectral type. 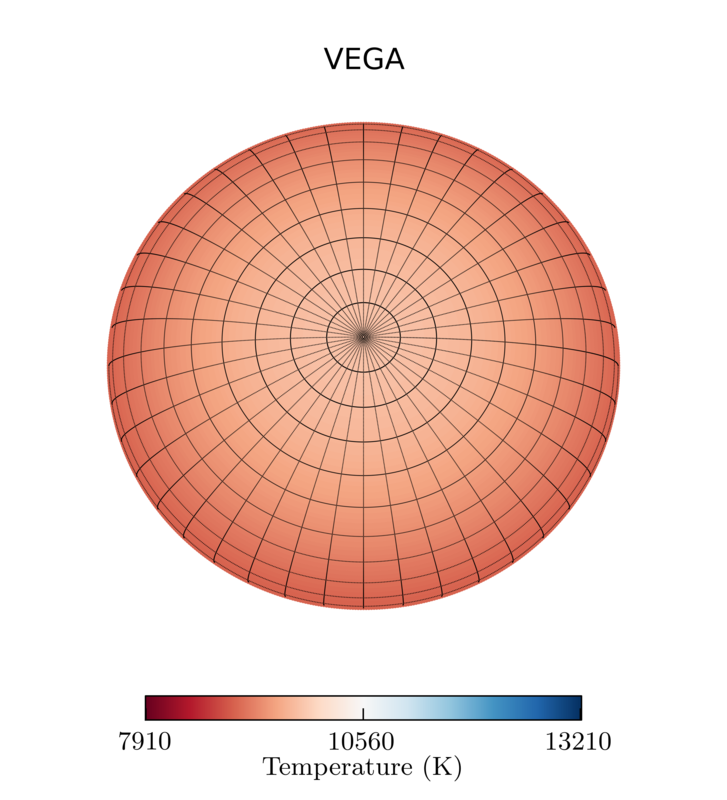 Two stellar populations spinning at different rates can be identified: stars cooler than F7 generally rotate at angular speeds lower than 50 km/s, while hotter stars are often rotating faster than 100 km/s. 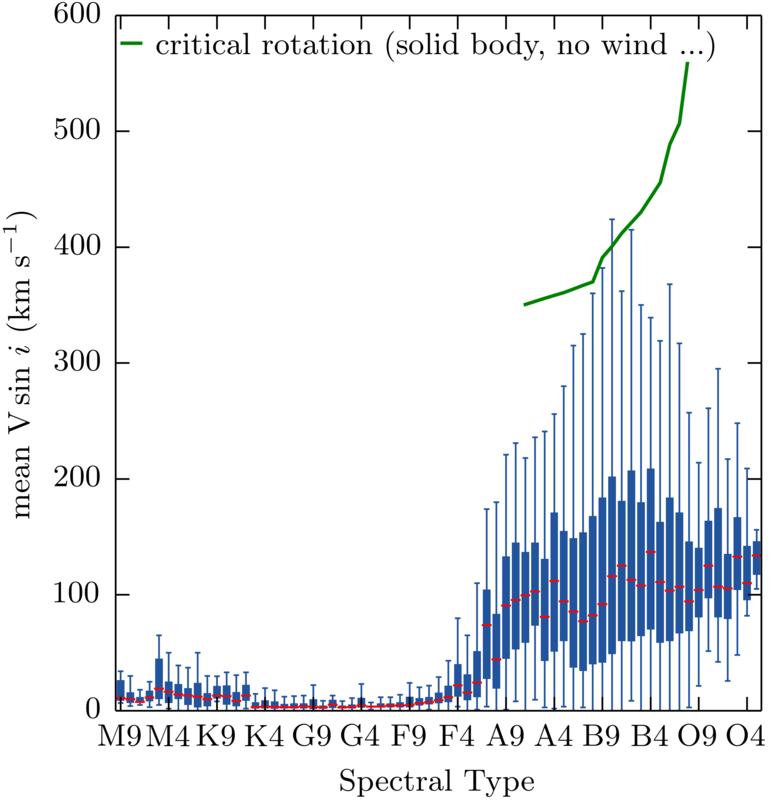 Rotation is indeed competing with other physical processes, and is impacted by the interaction between the magnetic field of cooler stars and their protostellar environment, or by the development of strong stellar winds at higher effective temperatures. Fig. 1: Median V sin i (red horizontal bars) vs. spectral type. Values are taken from the catalog of Glebocki R. & Gnacinski P. 2005. The steep increase of the mean apparent rotation rate around the early F-type stars is also what makes the main sequence intermediate-mass domain (2 to 12 Solar masses, A- and B-type stars) so interesting. It provides in a relatively reduced effective temperature range (7500 to 30000 K) a mixture of various phenomena that interfere with rotation (radiative diffusion, pulsation, and turbulent diffusion, binarity, macro- and micro-turbulence, magnetism, convection). The interplay of these physical processes is at the origin of the diversity in this particular area of the HR diagram (see Fig. 2 ), and of the appearance of several stellar classes such as: Be, β Cep, SPB, Am, Ap, δ Scuti, λ Bootis, RR Lyrae, γ Dor stars. In the past 20 years it was proven that, by its own, rotation significantly impacts the evolution of stars, f.e. 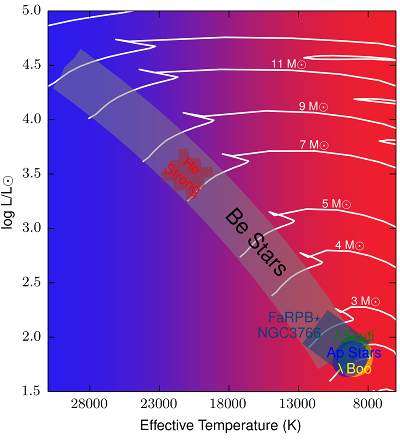 making high-mass stars spend more time on the main sequence. Due to the centrifugal effect, the equator is expanding, which leads to non-homogeneous temperature and density distributions from pole to equator (Fig. 3). This gravitational darkening triggers a turbulent mixing that in the most massive stars tend to homogenize the chemical content throughout the star, from the inner to the outer layers, while in the most extreme cases (e.g. 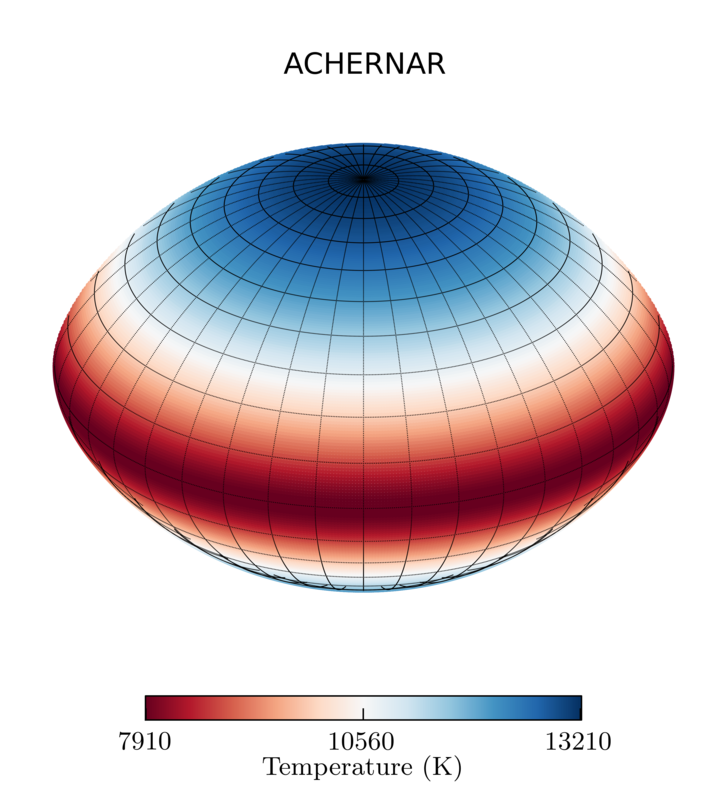 Be stars), of near to critical rotation, instabilities around the equator are at the origin of discrete matter ejection and of the formation of Keplerian circumstellar disks. These various phenomena triggered by rotation have, in various ways, an impact on the light and spectra of stars. 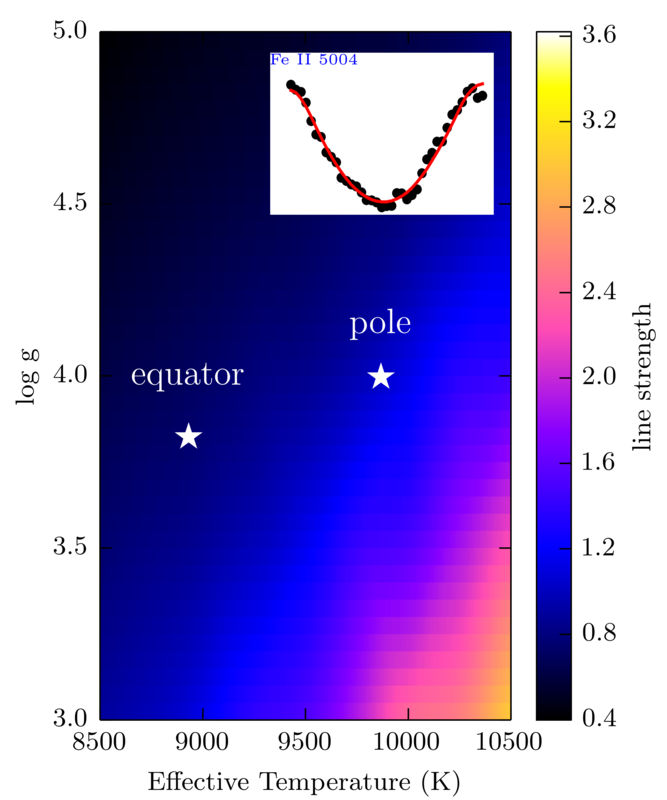 Stars may appear brighter or fainter, look cooler and more evolved than their non-rotating mass and age equivalents. 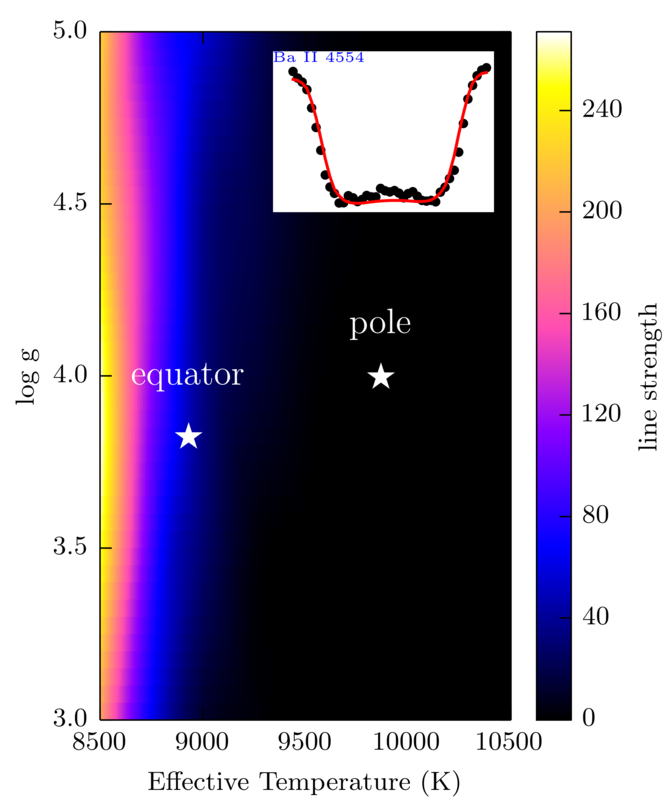 Under certain circumstances, in the spectrum of the same star, line profiles may appear triangular or rectangular shaped depending on their best temperature and pressure forming conditions (at the pole or equator as shown for Vega in Fig. 4). These are but a few consequences of rotation in high-mass to intermediate mass stars. It is with the aim to interpret in detail all the measurable effects, and to better understand the interplay of rotation with the other physical processes, that we currently work on the spectral synthesis of rapidly rotating stars.